LCWA recently helped AASM with two successful Twitter campaigns to raise awareness about new recommendations for adults to sleep seven or more hours per night. The first involved a #7andUp Twitter chat with AASM president Dr. Nathaniel Watson, CDC expert Dr. Anne Wheaton, the Sleep Research Society and moderator Huffington Post Healthy Living to discuss the new recommendations and overall importance of healthy sleep. 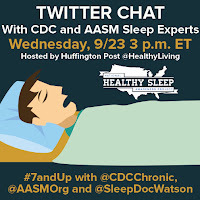 This was followed closely by a Twitter sweepstakes that involved funny, lighthearted comments of individuals for #YouKnowYouNeedSleepWhen, which was also paired up with the help of bloggers to spread the awareness of healthy sleep. LCWA worked with AASM to create timely tweets and images to help spread the hashtag and promote the giveaway on Twitter. The Twitter chat reached more than 18.3 million timeline impressions, and the sweepstakes ran for two weeks and generated more than 1,200 entries and 2.2 million timeline impressions. Upon completion, one winner was randomly selected to win a gift card and sleep pack to help them drift off -- hopefully for the seven (and up!) hours of healthy sleep they need per night!